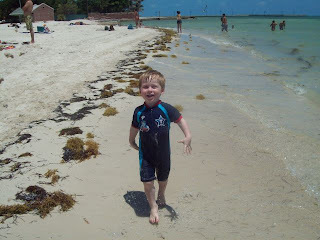 Originally, we were supposed to go to Cozumel, but because of the swine flu, we were re-routed to Key West. 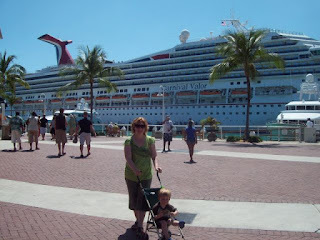 Tom and I went there on our last cruise, and loved it, so we weren't the least bit upset about the change of itinerary. Also, after thinking to myself in Grand Cayman "Wouldn't it be great if they had a train tour like they did in Key West?" it seemed like the most fortuitous of fortuitous events. So very first thing we went on the Conch Tour in a little train that toured the island. Sam was so ethralled with the experience that he fell asleep halfway through. That allowed us to hear the interestig tidbits our tour guide told us about life on the island. All in all, it was a great tour, and helped us get our bearings. Sam enjoyed the parts he was awake for and asked to ride it again at the end of the day. 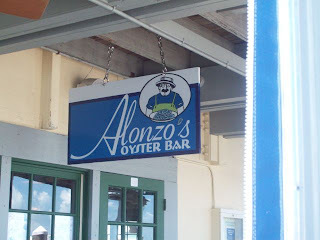 Once the tour was over, we headed off in search of Alonzo's. 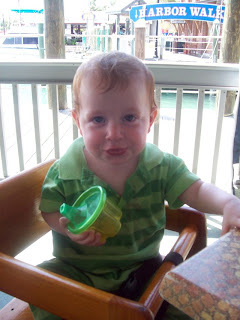 We'd had lunch the last time we were in Key West and had really enjoyed it. It's right on the harbor, and while you eat, you can watch the fishing boats come in and unload their catch. While the fish are being cleaned, pelicans and tarpons wait in the water below, and are thrown the scraps. It was highly entertaining. Plus, the food is just incredible. It serves the best seafood I've ever eaten. Tom had a red snapper sandwich that was to die for, and my freshly caught, grilled shrimp greek salad was also amazing. After lunch we walked across the island to the public beach so Sam could burn off some steam. 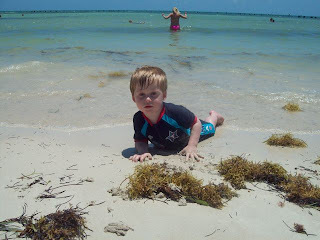 He had a great time splashing water and throwing sand at Tom. Then it was back to the ship for us.